In the mid-1920s, Palm Springs transformed from a health resort destination to a residential community. It was about that time when Hollywood discovered that the desert city’s proximity to Los Angeles and “anything goes” atmosphere made it a great place to unwind. Film stars began flocking in numbers to Palm Springs in the 1930s, especially after movie mogul Darryl F. Zanuck won a poker game against fellow studio executive Joseph Schenck. The prize? 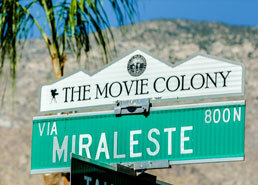 Schenck’s Palm Springs estate in what would soon become known as The Movie Colony. Centrally located, just a stroll to Downtown and Uptown.